Christine Brennan is the author of seven books. 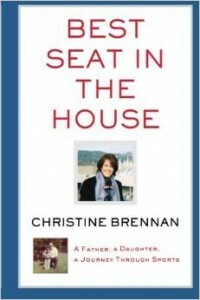 Her 2006 sports memoir, Best Seat in the House, is the only father-daughter memoir written by a sports journalist. Her 1996 national best-seller, Inside Edge, was named one of the top 100 sports books of all-time by Sports Illustrated. From the best-known and most widely read woman sports columnist in the United States comes a remarkable memoir of a father and a daughter, the story of a girl who would turn her love for sports into a trailblazing career. 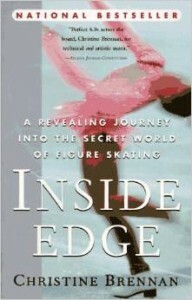 In Inside Edge, Christine Brennan chronicles–for the first time–a season on the skating circuit, intimately portraying the lives, on and off the ice, of the sport’s current and upcoming stars. Revealing the backstage conflicts high-profile figure skaters face, and the ambition that drives them, Brennan also tells the stories of their families, of improbable rises to the top, and of wasted talents. 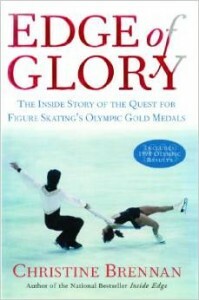 This is the riveting story of the year-long battle for the coveted Olympic gold medals in figure skating at the 1998 Winter Olympic Games in Nagano, Japan. Follow the journeys of Michelle Kwan, Tara Lipinski and many of the world’s best skaters as they travel through the most intense year of their young lives in Edge of Glory: The Inside Story of the Quest for Figure Skating’s Olympic Gold Medals. This coffee table book celebrates 25 years of the touring skating show Champions on Ice with an up-close look at the 2002 Olympic Tour, featuring Salt Lake City medalists Sarah Hughes, Alexei Yagudin and Michelle Kwan, among many others. It includes the photos of award-winning Sports Illustrated photographer Heinz Kluetmeier. Billie Jean King’s victory over Bobby Riggs in the “Battle of the Sexes” in 1973 was a pivotal moment in gender relations for generations of American women and men. 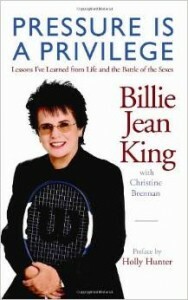 With the help of Christine Brennan, King shares in Pressure is a Privilege the life lessons that led to her success in that match, in sports, and in the world at large. Brennan with Olympic gold medalists Heather O'Reilly, Missy Franklin and Katie Ledecky. Learn more about booking Christine Brennan by contacting Keppler.